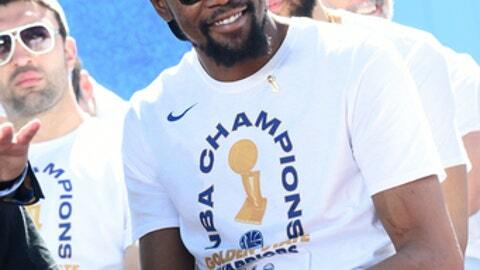 Durant has decided to sign a two-year deal with the Golden State Warriors, a person familiar with the situation told The Associated Press on condition of anonymity Saturday because the deal cannot become official until the league’s offseason moratorium ends on Friday. The deal comes with a player option for 2019-20, so Durant can – and likely will – become a free agent again next summer. Durant, Paul and George all knew what they were going to do even before the NBA’s moratorium – and the start of free agency – officially kicked in at 12:01 a.m. EDT on Sunday. So did plenty of other players, and by the time the moratorium was 2 hours old nearly $700 million worth of deals had been agreed upon, based on figures confirmed to AP by people involved in the various decisions. George took the stage at a party in Oklahoma City on Saturday night and announced that he will be staying with the Thunder, a move that might have been unexpected a year ago when he was traded away by the Indiana Pacers – presumably because of the belief that he was already focused on joining his hometown Los Angeles Lakers in free agency. James spent the week vacationing in Anguilla, and hopped aboard a private Gulfstream jet in the morning to fly to the Los Angeles area. By the time he arrived around midday – after his flight plan was tracked online – reporters and at least one news helicopter were waiting for the Cleveland Cavaliers star, who decided to become an unrestricted free agent and not opt-in to a $35.6 million deal for this coming season. ”The Lakers are FOREVER gonna be Kobe’s and Magic’s team…. Process that,” Philadelphia star Joel Embiid wrote on Twitter. AP Sports Writer Schuyler Dixon in Fort Worth, Texas contributed to this report.